Why Did NASA Kill the One-Person Spacecraft? On February 7, 1984, astronaut Bruce McCandless made history as the pilot for the test flight of the Manned Maneuvering Unit (MMU). On live TV, he backed away from the Space Shuttle Challenger, venturing 320 feet into space, becoming the first human satellite. But, by the end of the year, the MMU was mothballed. Writing in Air & Space magazine, Andrew Chaikin looks at the rise and fall of the MMU, which briefly allowed astronauts to travel untethered in Earth's orbit. Designs for a propulsive jetback had been under development since the earliest days of the U.S. space program. But champions of the idea encountered resistance from NASA, which had concerns about safety and whether an astronaut propulsion device had any genuine applications worth the price tag. With the rescue slated for a shuttle mission less than two years away, the MMU effort kicked into high gear at Martin Marietta. Program manager Bill Bollendonk and his team had to tackle a host of technical issues, including how to safely contain the backpack's nitrogen supply at a pressure of 3,000 pounds per square inch. The MMU's control system would use smaller gyros to sense rotation, then immediately fire thrusters to counteract it….Adjustable control arms would accommodate the tallest and shortest astronauts. Although the MMU proved unsuccessful in rescuing the Solar Max, in November 1984 astronauts Joe Allen and Dale Gardner used it to retrieve two errant communications satellites for return to Earth. The [shuttle] was so maneuverable that it proved simpler to just fly the orbiter over to an object or person and grab it, either with the robot arm or a gloved hand. This became clear even during the MMU's inaugural mission. During one spacewalk when McCandless was not wearing the jetpack, he accidentally let a foot restraint float out of the cargo bay. 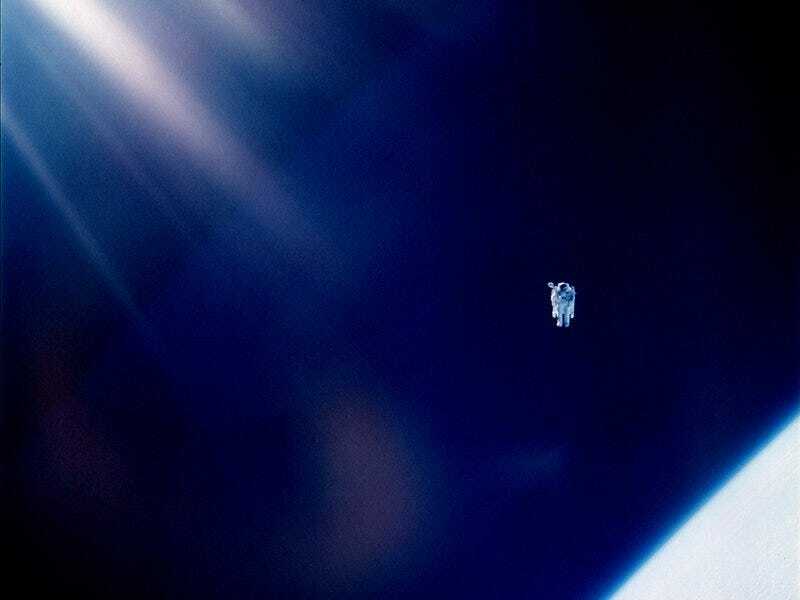 Commander Brand told him and Bob Stewart to hang on, then steered the orbiter to within a couple of feet of the object so McCandless could retrieve it. After Pinky Nelson's failed attempts to grapple Solar Max on the next flight, STS-41C commander Bob Crippen, using the shuttle's thrusters in a special low-impact mode, was able to fly Challenger and its robotic arm right up to the satellite without disturbing it. Following the 1986 Challenger disaster, safety regulations were instated that would have required the jetpack to undergo an expensive re-qualification; program managers, grappling with the cost of returning the shuttle to flight, were unwilling to spend the money. Today, some specialists advocate a next-generation MMU to help astronauts explore low-gravity worlds like asteroids or the moons of Mars, but so far NASA hasn't approved development. The astronaut jetpack remains a capable—some would even say compelling—technology in search of a mission.